A.I. in Energy: Hot Topic or Slow Burner? Artificial Intelligence is arguably the hottest topic in business right now. Just this week, PWC reported that nearly two thirds of global CEOs see its potential impact as “bigger than the Internet.” In sectors such as energy, threatened by climate change, scarcity and inequality, A.I. has the potential to revolutionise the way we live. But in the battle to be the next “big thing”, is A.I. really getting the coverage it deserves? Using the Signal platform to look at data for the last 12 months, we compared the Big 6’s media coverage relating to three key trends in the industry – A.I., innovation and renewables. We used our own A.I.-trained topics to accurately discover that A.I. is not yet living up to the hype. For the Big 6 in total, A.I. is still over 5x less covered than renewables. Only for the biggest player in the market, British Gas, does A.I. get more coverage than innovation, partly due to their investment into using big data to improve their customer support, which was covered in over 100 articles in June. These three topics are not only buzzwords that all energy companies have been focusing on recently, they are also potential key indicators of success and longevity within a firm. 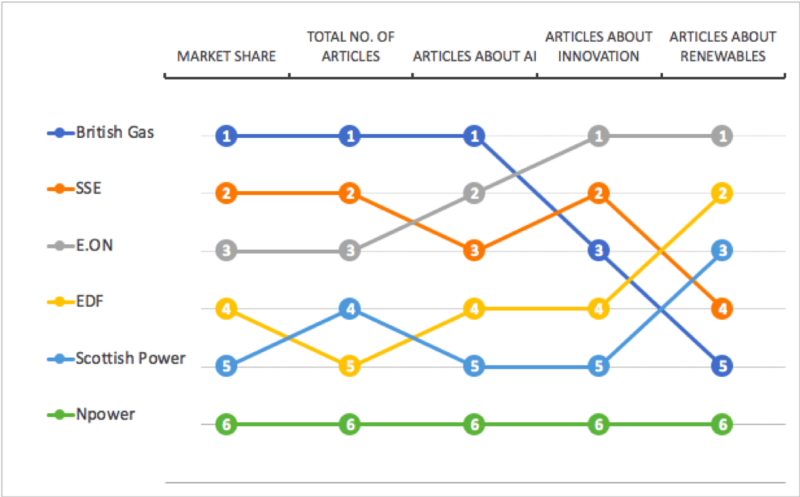 E.ON, although third in terms of market share and total media mentions, overperform in their relation to A.I., innovation and renewables, topping the latter two topics. Their commitment to the future of energy, which will likely be an amalgamation of these three topics, begins to explain how they have managed to maintain their market share since 2017. Over the same time period, 4 of the other 6 competitors have lost at least 1% to the rising challenger brands. Although not yet as prevalent in the news as other topics, the overall uplift in A.I.’s coverage in the energy market is very promising. Media coverage of A.I. usage from the Big 6 has increased over the last year with a compound quarterly growth rate of 36%, with Q4 2018 amassing 40% more mentions than Q1 and Q2 combined. A.I. coverage in almost all major sectors has increased over the last few years, at around 7% per quarter, but the energy industry is expanding at a far faster rate. Hopefully this trend can continue throughout 2019. Few still deny the capabilities of A.I. to improve efficiency, accuracy and consistency across industries, but for the Big 6 firms in the energy sector, these opportunities are yet to be fully explored. It seems like the market is still focusing on the challenges of the last decade, such as nurturing innovation and investing into renewable energy. In the same way that focusing on these has helped firms maintain market share in the past, could ignoring A.I. prove costly for the Big 6 in the future? Interested in tracking key media trends in your industry? Check out our Media Monitoring platform,Or Drop me a line and let’s chat.